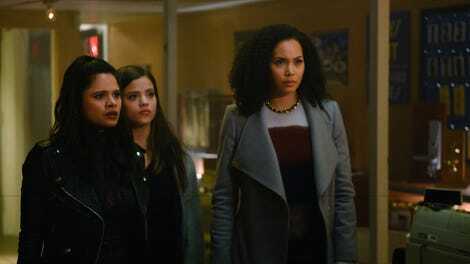 Through Maggie, the return of Charmed taps into its sweetspot of blending supernatural plotting with emotional character work, blurring the lines of the two worlds the sisters belong to in a coherent and meaningful way. Maggie’s devastated in the wake of learning that Parker lied to her and manipulated her. She feels betrayed by her powers. And for her, her emotions and her powers are inextricable. "Keep Calm and Harry On"
“I don’t want to feel like this anymore. I don’t want to feel anything,” she tells Mel. She doesn’t feel like she can trust anyone ever again, even herself. It’s all crushingly relatable breakup sentiment, and Sarah Jeffery plays it with enough specificity and potency to make it more than just cliche heartbreak musings. To try to resolve her human problems, Maggie comes up with a supernatural solution. She casts a spell to numb herself, to stop the feelings altogether. It’s a desire that heartbreaks inspire in reality (speaking from experience, to be frank), and since she’s a witch, she can actually do it. It naturally comes at a cost. Maggie overcorrects to the point where she’s zombie-like, unfeeling and lifeless. But even those supernatural consequences seem anchored in reality, the kind of numbness that sometimes comes with pushing painful feelings down. And because she’s an empath, those consequences also mean that because she can’t feel, she can’t use her powers. From a plot perspective, Maggie’s powers are somewhat tricky. It did seem off that she wouldn’t have picked up on Parker being a half-demon before and that the thoughts she was able to read were vague to the point where she remained in the dark. But in retrospect, it’s an interesting story choice. Being lied to in a relationship is a devastating, reality-shattering experience, and the fact that Maggie has a literal magical power that should have prevented something like this from happening but still got played is genuinely devastating, making her reaction visceral. At episode’s end, Parker tries to ask for her forgiveness. He has spent the whole episode helping her sisters rescue Harry and Maggie from Tartarus and betraying his father, but she makes it clear that she’s still hurt. Charmed moves very quickly, so I’m glad the writers aren’t just having Maggie move on from this or give Parker another chance so easily. The depth of his betrayal is significant, and Maggie’s reaction to it hits hard. Her power may be passive, but of all the abilities on the show, it’s the one that presents the most compelling storytelling opportunities, intrinsically linked to who she is and what she feels. Is it corny that Harry teaches her that her greatest power is hope and love? Of course it is, but it also works as a driving force for the character’s arc. She’s the most intuitive and optimistic of the sisters, and that radiance literally creates a light force that shields them from Parker’s father, who ends up so scared of the Charmed Ones’ growing powers that he flees town for now. Down in Tartarus, Charmed treats us to some backstory for Harry. Here’s where the show’s rapidfire pacing sometimes runs into issues though. The Harry flashbacks to his pre-Whitelighter life get shoved into an already pretty busy episode, and the emotional arc they send him on doesn’t get enough room to breathe, so it comes off as a little canned, and even though it has been hinted at for a while, even the big kiss with Charity is a little forced. It’s a Harry-centric episode without really being a Harry-centric episode at all. Meanwhile, there’s some interesting building still going on with Mel and Jada. The Sarcana goings-on are still a little disconnected from the rest of the narrative web, which is unfortunate since it’s one of the more complex and thrilling parts of the show’s mythology right now (way more so than Parker and his demon fam). The tension between the Sarcana and the elders is compelling but so far underexplored. Mel and Jada also finally act on the growing attraction between them, and that moment feels more earned. It’s then complicated by the fact that Niko witnesses them. I’m glad Niko’s back, and I’m curious to see what exactly that means both for the spell they cast on her and Mel’s emotional state. A lesbian love triangle is exactly the kind of situation that made me most excited about the new, gayer iteration of Charmed. The direction of the scene where Maggie casts the spell on herself is strong, adding a sense of intimacy to her magic. I’m still not totally sold on Galvin and Macy, but I am such a sucker for when the non-powered humans on a fantasy/sci-fi show don’t totally freak out when they learn about someone having powers and instead just think it’s extremely cool. Yeah, it’s a convenient choice, but it’s also just fun. Parker’s father apparently has a Killgrave-esque power called “mesmerizing,” where he can compel characters to do his bidding. We’ve seen him use this on Charity before, but it’s a lot scarier when he uses it on his human ex, Parker’s mother, and also makes whatever their relationship was before seem a lot more disturbing. The actor who plays Parker is unfortunately distractingly stiff.